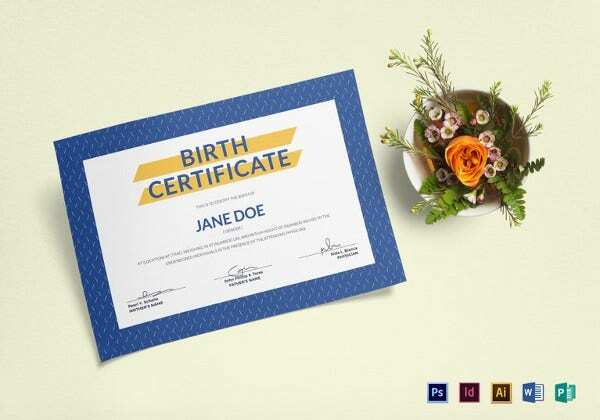 Birth certificates are forms or documents issued to record a person’s birth, and it includes identifying information such as name, gender, date of birth, place of birth, and parentage. 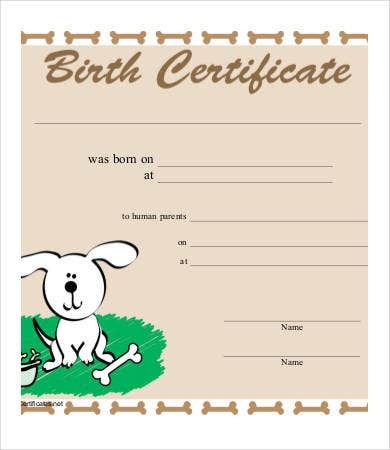 Depending on the authority, a record of birth may or may not contain authentication of the action by such as doctor or midwife. You may also see Certificate Templates. 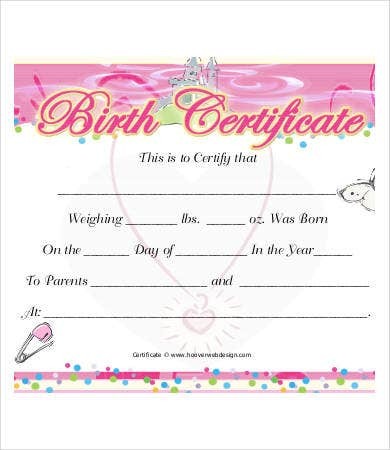 These types of certificates are mainly issued in hospitals and birthing centers. 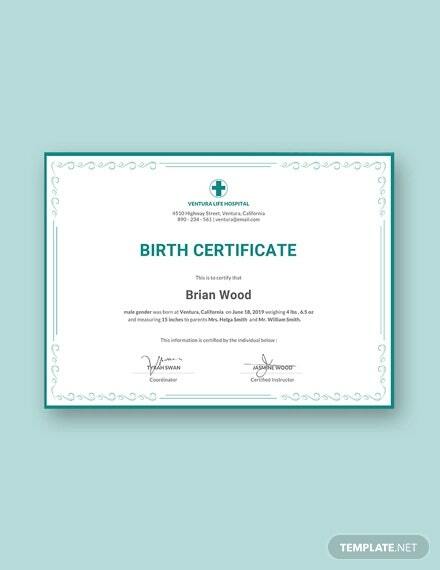 If you are having a hard time creating birth certificates for your birthing center, our birth Sample Certificate Templates are the answer. Check out the 6 templates from this selection and select which one you like best. These surely will save up some of your time. Child birth is one of the most rewarding experiences in a woman’s life. Also known as labor and delivery, it is a sign that pregnancy is going to end since babies will be leaving its mother’s uterus. Approximately, there were about 130 million births globally in the year 2015. In an advanced world, most deliveries happen in hospitals and birthing clinics, while in less developed places, giving birth usually happens at home with the assistance of a traditional birth attendant or midwife. What Are the Ways of Giving Birth? We all know about live natural births and Caesarean section births, but little do we know there are other ways mothers give birth to their offspring. NSVD (Normal Spontaneous Vaginal Delivery). The most common way of giving birth. A baby is born through the birth canal. Most women give birth at around 38–41 weeks, approximately 9 months. C-section (Caesarean section). Involves a surgical procedure where the baby is delivered through the woman’s abdomen. In some instances, C-section is scheduled ahead of time, and others are due to an unforeseen complication. Forceps delivery. A type of operative vaginal delivery. Might or might not be needed in the course of vaginal childbirth. Vacuum extraction. A procedure done in the middle of vaginal childbirth. 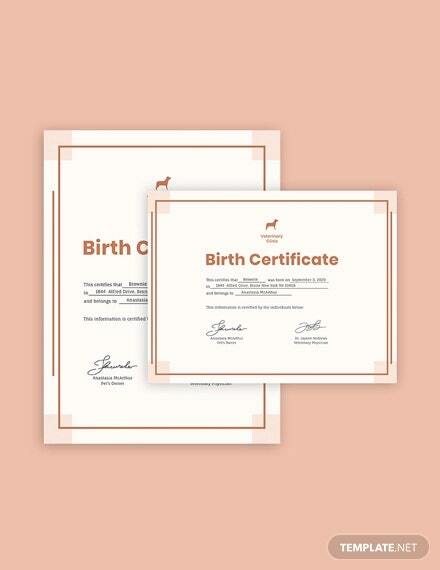 If you couldn’t find the birth certificates you want here, we have more Printable Certificate Template and Blank Certificate Template samples on our website. 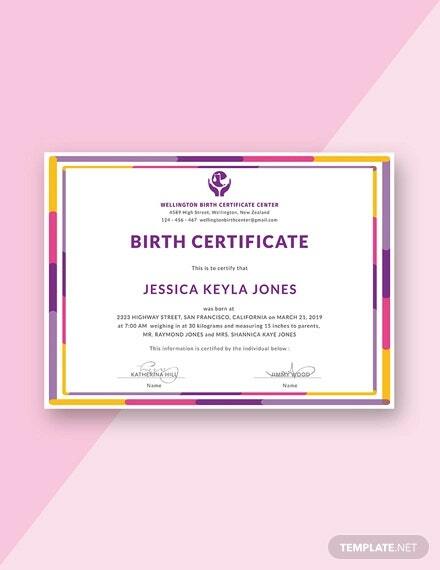 Now you know that giving birth has several ways and procedures, and after any of these procedures are done, providing birth certificate will take place soonest. 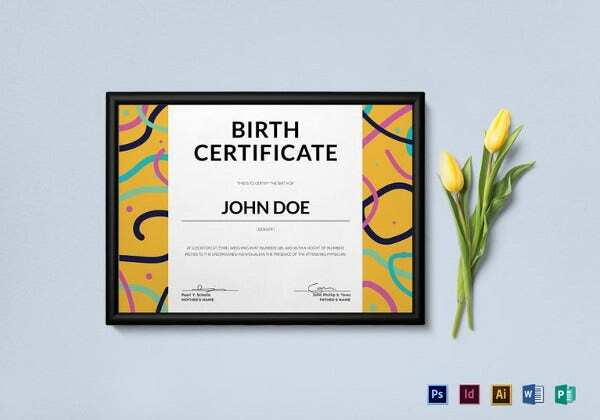 A birth certificate serves as a proof or remembrance that your child was born in this place, date, and time, along with the parents’ name, of course. 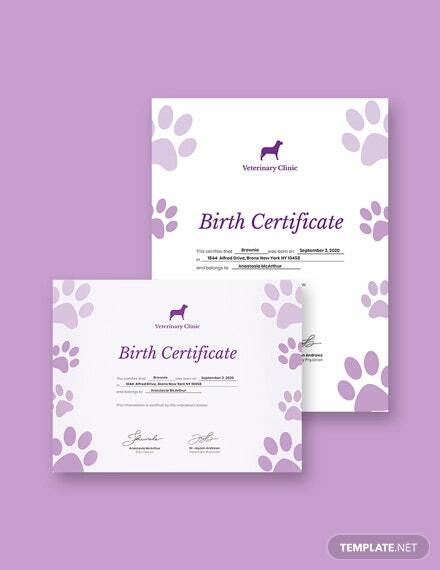 If you are looking for birth certificate templates for your birthing clinic but you can’t seem to find any, you are on the exact page. 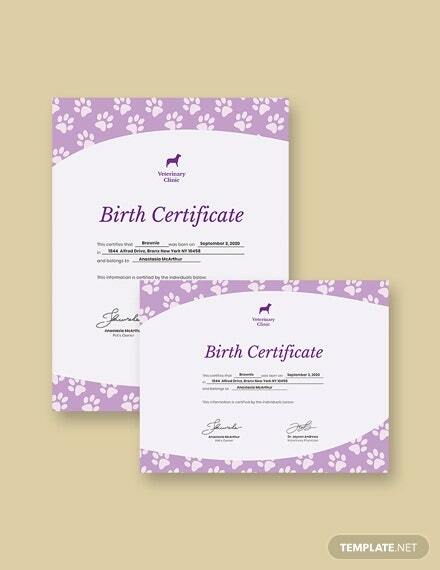 We offer 6 samples of a birth certificate templates that you can make use of. Each contains a cute and artsy design that you will surely love. 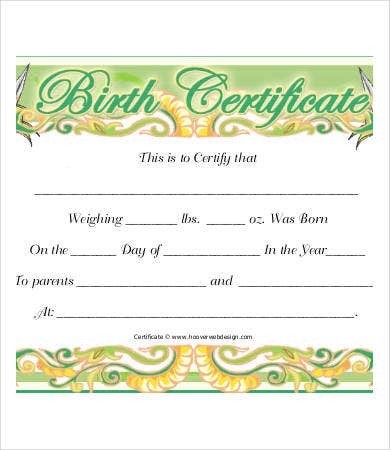 It’s time to give a little bit of kick to those usual birth certificates that come in plain white color. With our selections, each contains vibrant colors and beautiful designs. These come in a high-quality resolutions for a much clearer layout pattern. Not just that, these also come in modifiable formats, meaning you can edit them however you want. If you want to change the color, change the font style, add an image, or add more detail, feel free to do so. So go ahead and download them now! 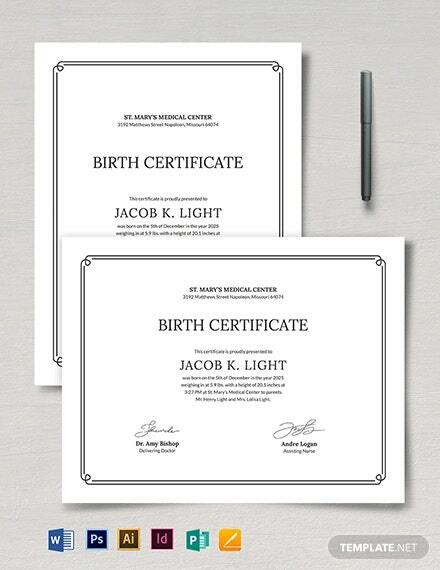 Looking for precreated medical certificates? 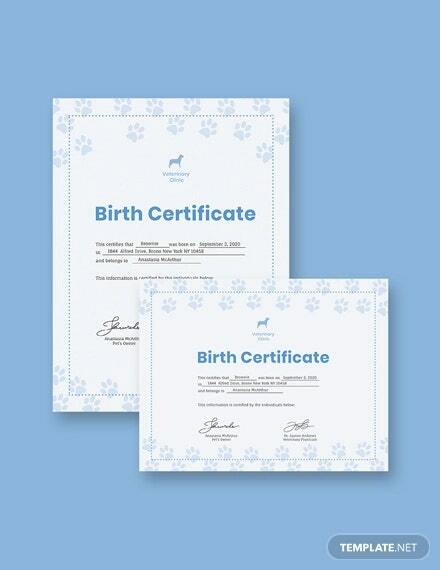 Check out the Medical Certificate Template samples we have in store.